Chef’s Gourmet Premium Popcorn is made locally in Melbourne. Gourmet popcorn has become our passion and we’ve grown with it to develop a product you will love. We’re committed to making the absolute best quality product by sourcing the finest ingredients and crafting each batch to perfection. This delicious LIMITED EDITION flavour features the world’s number one biscuit – OREO! 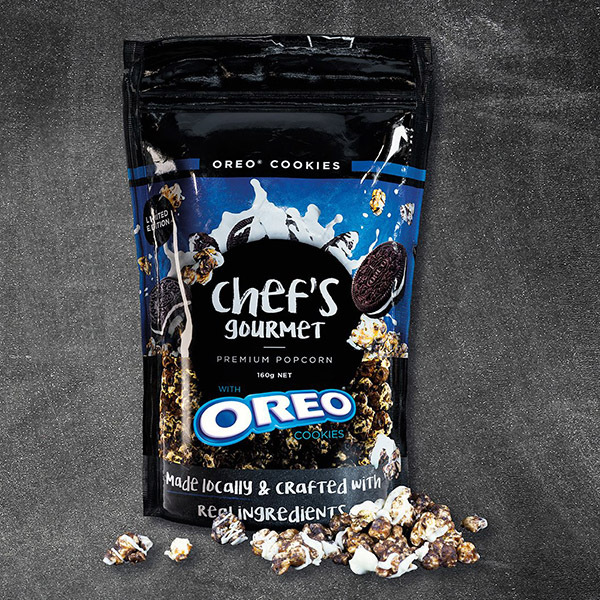 Cookie chucks are mixed with white chocolate and crunchy popcorn to create an indulgent snack that is not to be missed. Chef’s Gourmet Premium Popcorn varieties can be purchased at the Candy Bar.